The journey that leads many of our guests to Family House is oftentimes a long and unpredictable one. Life can be going fine at one moment and then be turned completely upside down the next moment. Seventeen years ago, Martha Valentine was diagnosed with tongue cancer while she and her husband, Joe, were living in Juneau, Alaska. A trained physical therapist, she put her career on hold so she could receive chemotherapy treatments. 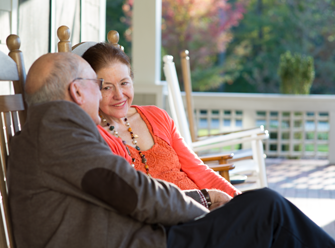 With the cancer under control, Martha and Joe moved to Martinsville, Virginia, in 2001 to be closer to their sons. For the past 14 years, she’s been coming to UNC Hospitals for follow-up treatments, seeing her long-time head and neck surgeon, Dr. Mark Weissler, who she describes as “caring and straightforward.” In May, Martha was told that the cancer had returned to her tongue. And then just last month, she was given the devastating news that the cancer had now spread beyond her tongue. She immediately agreed to enroll in a clinical trial, optimistic that the new drug would destroy her growing cancer. Martha and Joe have been coming to Family House on and off since June. While she receives the therapeutic drug through weekly chemotherapy, she and Joe are now staying here for part of six consecutive weeks. During these visits, Joe fits in various medical appointments for himself. A few months ago, Martha became good friends with another Family House guest, Edna Bruce. In between treatments for an abdominal hernia, Edna was always in the kitchen, busying herself with cooking, cleaning, and basically doing whatever needed to be done to keep our kitchen clean and running smoothly. When Edna found out that Martha was having surgery, she pulled her aside and told her that someone needed to pray with her, so this is what these two newfound friends did for the next several days. Martha tells us that staying at Family House has been a humbling experience for her and Joe. Meeting so many guests who are undergoing chemotherapy has given them both encouragement and enlightenment. The weekly activities here have also kept them engaged with the other guests: live music, therapy dogs, reiki, and of course, the nutritious and delicious meals that are prepared for our guests 4 – 5 days each week. 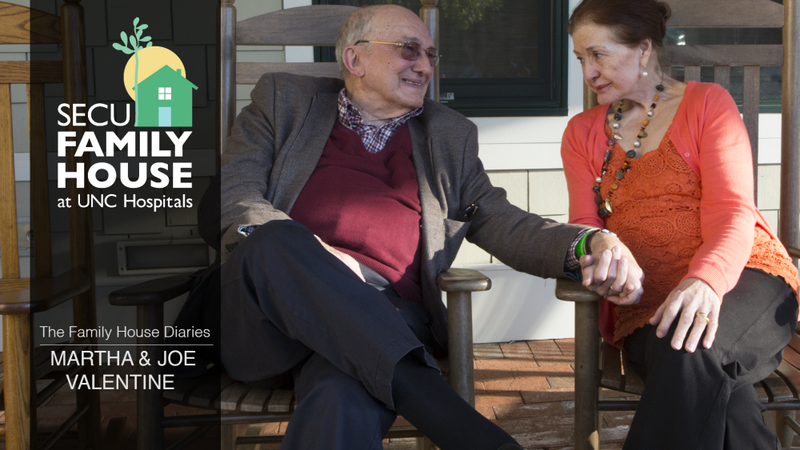 Joe and Martha are featured in a Family House Diary video story. They are some loving people and are very thankful to know them as well as everyone else. Martha and joe have some very interesting stories and they dont mind sharing them and we wish them the best as well as everyone there.